It's Just Mobolaji | Music & Entertainment: New Music: Sistas Unite ft. May7ven, Ezi Emela, Mrs Melodey, Honey B and More! New Music: Sistas Unite ft. May7ven, Ezi Emela, Mrs Melodey, Honey B and More! I can't lie - before even hearing the actual song, I thought it'll be proper cheesy, upon me pressing play and my whole perspective changed big time. A collective group of talented females across the UK including: May7ven, Ezi Emela, Mrs Melodey, Shiiikane, Honey B, Vicky Sola, Zafi B, Amal Fashanu, Waliyah, Fay Roux, Ada Snoop, Belinda and Saffie have all come together and teamed up to make this powerful anthem. 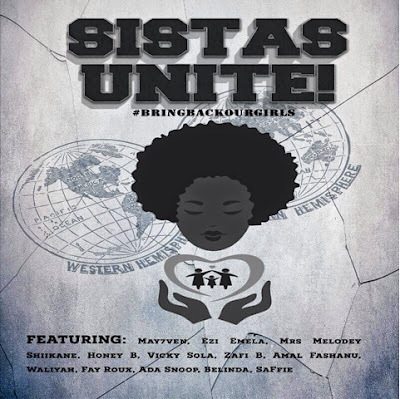 Based on the events of last month in Nigeria - the 13 ladies are carrying on with the '#BringBackOurGirls' campaign with this new ‘Sistas Unite’ single. After premiering on CapitalXtra's Afrobeats show with Abrantee two weeks ago - ‘Sistas Unite’ has been in demand for it's release, and now it's finally here. ‘Sistas Unite’ was produced by up and coming producer McTizzle who does an exceptional job on the song with a little help from OJ Sax who adds his own saxophone touch on the song. Bought together by Sistas Unite founders Daniel Sync Media and M7 Music Publishing - ‘Sistas Unite’ is bound to go a long way, and touch the hearts of many people worldwide. Unite with May7ven, Ezi Emela, Mrs Melodey, Honey B and more below!